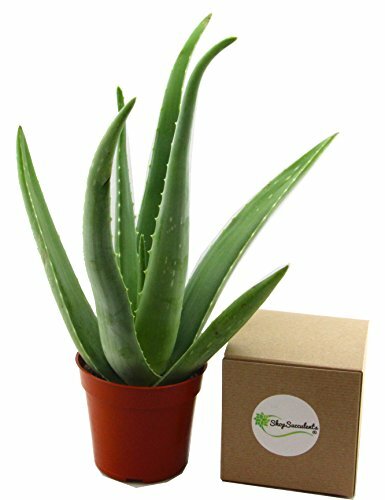 These healthy aloe vera plants bring a wonderful sense of greenery and healing to a space. Revered for their medicinal power and hardy nature, aloe vera plants are one everyone should have in their collection. These 4" plants are perfect size for an accent plant on a bookshelf or kitchen counter. Each order is meticulously packaged in Shop Succulents retail packaging, which makes these aloe plants a perfect gift! These plants come fully rooted in their 4 inch round pots. All orders are packaged to protect the plants in transit, and come with detailed care instructions. Please be sure to promptly remove the plants completely from their boxes upon arrival and keep in mind that post-transit, the plants will need fresh air, water, sun, and some loose soil gently brushed from the leaves. Each 4" aloe vera is hand picked. Plants may vary from pictures as they are selected based on season, size, health, and readiness. Plant may vary slightly in shape and color from pictures as plants are selected based on season, size, health, and readiness. We ensure that all of our plants are held to an exceptional standard exceeding quality expectations. The Aloe Vera plants come in 4" round pots fully rooted in soil. Plant measurement will vary as different species grow in different ways: for example, some grow wider, shorter, taller, etc. All of our aloe are carefully packaged in Shop Succulents retail packaging, making these ideal gifts. All Shop Succulents plants come with helpful care instructions in every pack detailing ideal watering methods, frequency, and optimal sun exposure.